Gresham | Clean Air Act Inc.
A basic part of air conditioning operation is the fans. There are two fans in an AC: the indoor blower fan that sends air from the return vents past the evaporator coil (cooling the air) and then out into the ventilation system; and the outdoor fan that pulls in exterior air and exhausts heat. The fans are not only crucial for sending air through the vents, but for permitting heat exchange to occur. 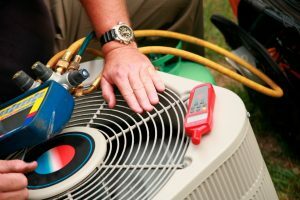 If the fans in your air conditioner develop faults, you will need to have professionals look into their operation, diagnose the problem, and apply targeted repairs. This isn’t something you should attempt to do on your own. For the necessary air conditioning repairs in Gresham, OR that will take care of your fan problems, contact Clean Air Act any time of the day or night. Failing capacitors: A fan that has trouble starting or remaining on may have problems due to the capacitor. Capacitors are the cylindrical components that transfer voltage from the electric system into the fan motors. If a capacitor begins to fail due to age or overstress, the fan will experience problems starting; usually you will hear an odd clicking noise as the fan attempts to start up. Call for repair technicians to replace the capacitors or install a “hard start kit” to solve the problem. Bent fan blades: This is a common trouble for outdoor fans, which can sustain damage from rocks, gravel, sticks, and other debris that enter the outdoor cabinet. When fan blades suffer from damage that bend them, the blades will start to strike the edge of the fan casing, creating a terrible noise and spreading around the damage. When you hear loud mechanical noises coming from the cabinet, shut down the system and call for repairs immediately. Fan motor failure: The fan motor can suffer from a number of electrical and mechanical issues. The most common is motor freeze from stress on the mechanical moving parts due to wear and tear or excess dirt. If there is too much stress on the motor, it could burnt out and fuse its wiring, in which case the motor must be replaced. Smaller issues that can stop the motor include broken relays and loose wiring, which are usually simple fixes for a repair technician. Fan, motors, and capacitors are too complicated for non-professionals to handle, so don’t turn to amateurs or a DIY guide for the work: call Clean Air Act and let our training and expertise fix the fans that are threatening your cooling. For all your needs for air conditioning repair service in Gresham, OR, put your trust in us. Posted in Air Conditioning | Comments Off on How Do Limit Switches Work in Air Conditioning Systems? Having proper duct size is vital to having a Portland air conditioning system that functions appropriately. If the air ducts are too small not enough cooled air will reach the intended rooms, if the ducts are too large the air will not have enough force to make its way from the AC to the room vents. As such there are some AC industry standards for duct sizing which should be followed by any Portland air conditioning professional. While there are many misused rules of thumb in the AC industry, there are also some newer standards which have been put into place such as “Manual D” methods of design that have already begun to improve performance of AC systems in homes and offices. There is a difference between what is needed for an AC system supply ducts and return ducts. Supply ducts tend to need smaller ducts while return ducts will often need to be larger. Proper air duct sizing greatly depends on the square footage of the building being cooled, the air conditioner capacity or BTUs, how many ducts will be utilized, where they are positioned, and how many vents there are. Additionally, the entire system will need to be properly balanced so that the AC works efficiently. Duct sizing is based on the air volume that will be produced and the velocity at which it will be flowing through the ducts. Determining the proper combination of these factors with the AC that will be used is essential to having a duct system that works efficiently. A good rule of thumb for proper air flow is to have anywhere from 600 to 900 feet per minute of air flow flowing through the ducts. To reach this, the cubic feet per minute will be determined, which will then be compared with a standard friction rate of 0.1 inches of water per 100 feet. This calculation will result in an appropriate duct size for either rectangular or round ducts based on the size of the building and how powerful the AC is. Air ducts should be properly sized prior to being installed. Call The Clean Air Act, Inc. today to learn more about AC installation! A heat pump often uses an intermediate fluid called a refrigerant which absorbs heat as it vaporizes and releases the heat when it is condensed, using an evaporator to absorb the heat (or energy) from inside an occupied space and forcing this heat to the outside through the condenser. The key component that makes a heat pump different from an air conditioner is the reversing valve which allows for the flow direction of the refrigerant to be changed, allowing the heat to be pumped in either direction. As technological improvements are refined during this time of climate change and dwindling fossil fuels, heat pumps promise to play an important part in our futures. If you are interested in having a heat pump installed in your home, call Porland HVAC professionals Clean Air Act Inc.! The main idea behind getting a home energy audit is to figure out the heat loss (or gain) of your home. That is, how much heat are you losing to the outside world? Heat that doesn’t stay in your home obviously does little to benefit you in terms of keeping your house warm, and can be costly in terms of increased utility bills and repair costs over time. Aside from determining how much heat your home is losing, a home audit can also point you in the direction of weak or thin spots in your home’s insulation. By identifying areas that are letting out the most heat, you can prioritize your strategy to prevent heat loss. Most often, this starts with doors and windows. A good home energy auditor will present you with solutions for your heat loss problems, creating an opportunity for you to upgrade the equipment or materials in your home. This can solve your heat loss problems in one fell swoop. Such solutions include energy efficient glass, new sealant around doors and windows or upgraded insulation, especially in upper floors. Preventing heat loss increases the efficiency of your heating system, which saves you money. Your heating bills are reduced, and your furnace has to run less, which means fewer repairs and a longer life for an expensive piece of equipment. In short, spending money on a home energy audit and heat loss solutions are sound investments. The benefits of a home energy audit are numerous, which is all the more reason to take advantage of having one done in your home. It is also a good thing to do for the environment! So call The Clean Air Act today to have yours scheduled.